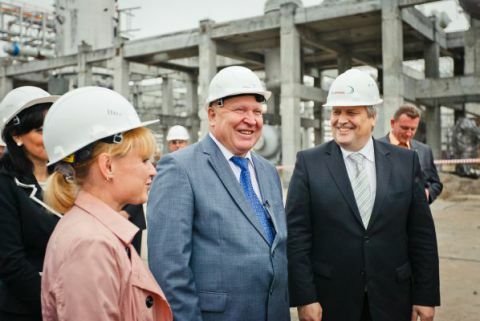 Today Valeriy Shantsev, the governor of the Nizhniy Novgorod region attended with a working visit RusVinyl construction site in Kstovo Promzona, where the Company is implementing the construction of the biggest in Russia polyvinylchloride complex. During the construction site visit the governor could personally evaluate the progress of the PVC Production Complex construction, which started in July 2010 and now is actively under way with erection of frames of industrial facilities, laying of necessary communication; the buildings of in-house substations are close to the completion. In the end of July, the installation of the oxychlorination reactor -weight is 170 tons, length is 21.1 m, and diameter is 5.5. m – designated for dichloroethane synthesis (EDC), one of the main components for PVC production, was completed. Currently, more than 120 units of equipment, including 19 oversized and heavy facilities have been already installed at the production zones. The overall project progress, including engineering, procurement and construction is about 65%. Also the governor hold at place a short working meeting where he heard RusVinyl management reports concerning the construction progress and the implementation status of related infrastructure projects.